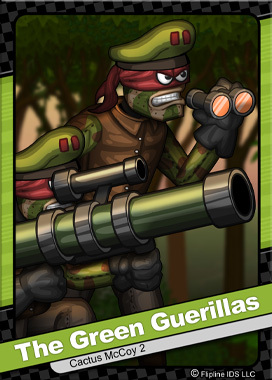 The Green Guerillas are a fearless group of mercenaries whose camp is hidden deep within Makopa Jungle. They were hired by Malana Mire to keep Cactus McCoy out of the jungle and off her trail. Green Guerillas were paid in advance by Malana Mire with an ancient Reptara relic, The Jade Skull.